Nickname Amanda Jane Weir also went by the name of Manda. Name Variation Amanda Jane Weir was also known as J. Amanda. Married Name October 1878 As of October 1878,her married name was Crotchett. Amanda Jane Weir was born in February 1859 at Minnesota. Amanda Jane Weir died after April 1930. Amanda Jane Weir had 6 with 6 living in 1900 children. 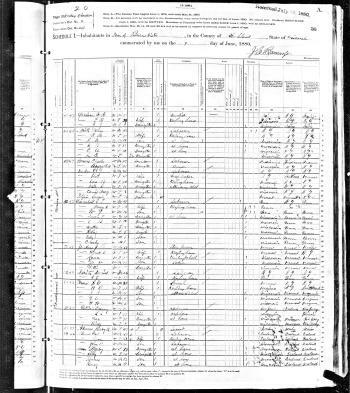 [S245] U.S. Federal Census 1900 U.S. Federal Census, by Ancestry.com, Year: 1900; Census Place: Pajaro, Santa Cruz, California; Roll: 111; Page: 21B; Enumeration District: 0083; FHL microfilm: 1240111. [S250] U.S. Federal Census 1930 U.S. Federal Census, by Ancestry.com, ED34-65. Dwelling 159. Name Variation Frank Berthley Crotchett was also known as Frank Berthel. Frank Berthley Crotchett was born on 16 December 1879 at Louisburg, Wea, Miami, Kansas. He was the son of Charles Perry Crotchett and Amanda Jane Weir. Frank Berthley Crotchett married Edith Caroline Thompson, daughter of (?) Marsh, on 12 May 1903 at Peoria, Illinois. Frank Berthley Crotchett obtained US Social Security Card; according to California death records. [S243] U.S. Federal Census 1920 U.S. Federal Census, by Ancestry.com, ED559. Dwelling 36. Stamp 251. [S250] U.S. Federal Census 1930 U.S. Federal Census, by Ancestry.com, ED19-1364. Dwelling 127. Married Name 8 September 1906 As of 8 September 1906,her married name was Coulson. Gretchen Rue Crotchett was born on 25 March 1889 at Corralitos, Santa Cruz, California, also reported as Mar 1890. She was the daughter of Charles Perry Crotchett and Amanda Jane Weir. Gretchen Rue Crotchett married Clarence Coleman Coulson on 8 September 1906 at Reno, Nevada. Gretchen Rue Crotchett obtained US Social Security Card at California; Last residence San Mateo, San Mateo, California..
[S250] U.S. Federal Census 1930 U.S. Federal Census, by Ancestry.com, ED29-17. Dwelling 31. [S373] U.S. Federal Census 1940 U.S. Federal Census, by Ancestry.com, Year: 1940; Census Place: San Francisco, San Francisco, California; Roll: T627_312; Page: 6B; Enumeration District: 38-389. Clarence Coleman Coulson was born on 15 February 1880 at Ohio. He married Gretchen Rue Crotchett, daughter of Charles Perry Crotchett and Amanda Jane Weir, on 8 September 1906 at Reno, Nevada. Clarence Coleman Coulson obtained US Social Security Card; as reported in the California death index. Married Name 4 May 1929 As of 4 May 1929,her married name was Pederson. Married Name after 1950 As of after 1950,her married name was Brzuchalski. Hazel Rue Coulson was born on 28 April 1908 at Floriston, Nevada, California. She was the daughter of Clarence Coleman Coulson and Gretchen Rue Crotchett. 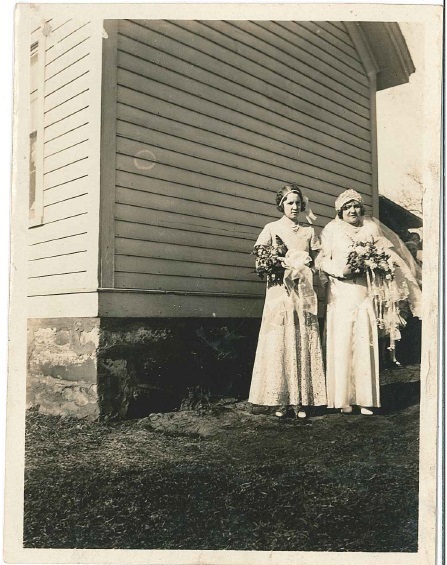 Hazel Rue Coulson married Lawrence Benhard Pederson on 4 May 1929 at Reno, Nevada. Hazel Rue Coulson married George Brzuchalski after 1950. Hazel Rue Coulson died on 3 August 1982 at San Mateo, California, at age 74. Hazel Rue Coulson obtained US Social Security Card at California; Last residence San Mateo, San Mateo, California..
George Brzuchalski was born on 19 January 1913 at Missouri. He married Hazel Rue Coulson, daughter of Clarence Coleman Coulson and Gretchen Rue Crotchett, after 1950. George Brzuchalski obtained US Social Security Card at Missouri; last residence San Mateo, San Mateo, California. Married Name Her married name was Crotchett. Married Name before 1810 As of before 1810,her married name was Redkins. Patience (?) married John Crotchett. Patience (?) was born before 1775. She married William Redkins before 1810. 1820 Monroe, Pope, Illinois Patience (?) was referenced on William Redkins's household in the 1820 Census at Monroe, Pope, Illinois; page 83. Household includes 1 male (age 10-16), 1 male (age >45), 1 female (age 16-18), 1 female (age >45). Patience (?) lived with John Crotchett before 1810 at Pope, Illinois. Name Variation Jonathan Robnett was also known as Johnathan. Name Variation Jonathan Robnett was also known as Robinett. Jonathan Robnett was born on 18 February 1838 at Illinois. Jonathan Robnett died on 27 May 1903 at age 65. He was buried after 27 May 1903 at Antioch Cemetery, Rosebud, Pope, Illinois. [S186] Illinois, Illinois Statewide Marriage Index, Vol 00A/ Page 0063 License 00000024. [S245] U.S. Federal Census 1900 U.S. Federal Census, by Ancestry.com, ED63. Dwelling 47. William Tracy was born in 1781 at Rutherford, North Carolina. He was the son of Nathaniel Pradian Tracy and Mary Ann Tidwell. William Tracy died on 6 July 1846 at Franklin, Johnson, Indiana. Free White Persons - 20 thru 49: 1. William Tracy emigrated with his father's family from North Carolina to Henry County Kentucky in 1796. In 1827, he emigrated to Indiana and settled six miles south of Franklin, Johnson Co. where he died aged 65 years. Two of his sons, Thomas and John F. volunteered for the Mexican War and fought in the battle of Buena Vista and some other engagements. John F. was killed on the plains while on his way to California in 1853. William Tracy migrated in 1827 at Indiana. Name Variation Martha Wooten Tracy was also known as Tracey. Married Name 3 March 1824 As of 3 March 1824,her married name was Peggs. Martha Wooten Tracy was born on 19 April 1807 at Kentucky. She was the daughter of William Tracy and Elizabeth Tanner. Martha Wooten Tracy died on 29 December 1863 at Franklin, Johnson, Indiana, at age 56. She was buried after 29 December 1863 at Greenlawn Cemetery, Franklin, Johnson, Indiana. [S248] U.S. Federal Census 1860 U.S. Federal Census, by Ancestry.com, Page 42. Dwelling 345. Elizabeth VanNatta was born on 3 August 1733. She was the daughter of Arien VanNatta and Elizabeth Chrisom. Emanuel VanNatta was born on 25 April 1737. Samuel VanNatta was born on 29 October 1738. Samuel VanNatta married Elizabeth (?) in 1758. Samuel VanNatta died on 29 August 1766 at Sommerset, New Jersey, at age 27. Married Name 1758 As of 1758,her married name was VanNatta. Elizabeth (?) married Samuel VanNatta, son of Arien VanNatta and Elizabeth Chrisom, in 1758. Arie VanNatta was born in 1745. Arie VanNatta married Jacementie (?) in 1767. Married Name 1767 As of 1767,her married name was VanNatta. Jacementie (?) married Arie VanNatta, son of Arien VanNatta and Elizabeth Chrisom, in 1767. Benjamin VanNatta was born in 1745. Jacobus VanNatta was born on 11 January 1746. Name Variation William George Shultz was also known as Schultz Son, Doug, confirmed that the correct spelling is Shultz. It is sometimes listed incorrectly as Schultz. The spelling changed several generations back. William George Shultz was born on 5 March 1930 at South Dakota. He was the son of Martin Luther Shultz and Gladys Martin. 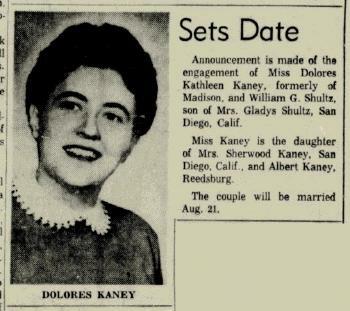 William George Shultz married Delores Kathleen Kaney, daughter of Albert Charles Kaney and Wenonah Magli Sherwood, on 21 August 1959 at San Diego, California, Delores Kathleen Kaney and William G Shultz engagement announcement. William George Shultz and Delores Kathleen Kaney were divorced before 1985. William George Shultz died on 5 May 2012 at Gardena, Los Angeles, California, at age 82. Vincent W. Bindl was born on 6 December 1908 at Wisconsin. He was the son of Henry Jacob Bindl and Theresia Kate Dischler. 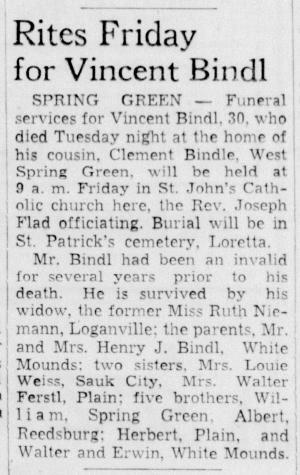 Vincent W. Bindl married Ruth Niemann, daughter of John Henry Niemann and Rose Ellen Kaney, between 1930 and 1937 first marriage for Ruth. 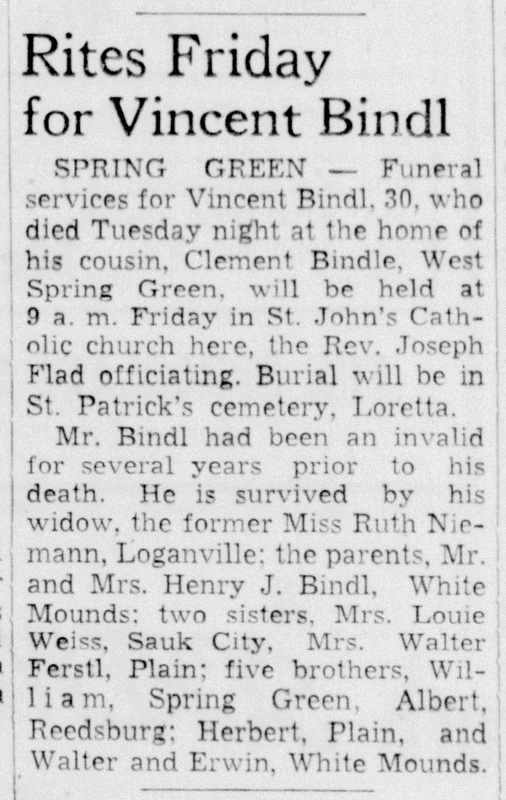 Vincent W. Bindl died on 25 April 1939 at age 30 Vincent Bindl, 30, obituary. [S244] U.S. Federal Census 1910 U.S. Federal Census, by Ancestry.com, ED115. Dwelling 79. [S243] U.S. Federal Census 1920 U.S. Federal Census, by Ancestry.com, ED164. Dwelling 16. [S250] U.S. Federal Census 1930 U.S. Federal Census, by Ancestry.com, ED56-13. Sheet 1A. Dwelling 1. Name Variation Teresa Bindl was also known as Thersa. 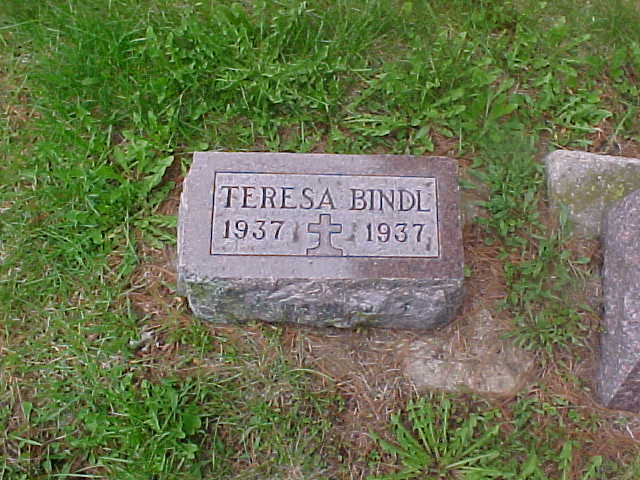 Teresa Bindl was born on 2 July 1937. She died on 2 July 1937 at Richland, Wisconsin, died at birth. 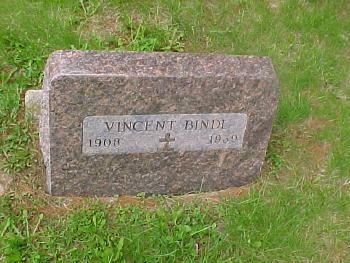 She was the daughter of Vincent W. Bindl and Ruth Niemann. James McCarville was born in August 1833 at Ireland also reported as 1830. James McCarville married Julia Anna Phelan, daughter of John Phelan and Catherine Slevin, circa 1852. James McCarville married Julia (?) on 12 February 1877 at Crawford, Wisconsin. James McCarville died on 12 October 1908 at Sauk, Wisconsin, at age 75. His estate was probated on 2 March 1909 at Sauk, Wisconsin. Section 21 Township 10 N Range 3 E Acreage: 80 DocID: 24814. [S180] Wisconsin Sauk Co Cemetery Records Vol 6, page 7. [S247] U.S. Federal Census 1870 U.S. Federal Census, by Ancestry.com, stamp 44. Dwelling 106. [S245] U.S. Federal Census 1900 U.S. Federal Census, by Ancestry.com, ED129. Dwelling 81. [S364] Wisconsin State Census Wisconsin State Censuses, 1895 and 1905, by Ancestry.com, Dwelling 159. Name Variation Julia Anna Phelan was also known as Julia Annie. Name Variation Julia Anna Phelan was also known as Anna. Married Name circa 1852 As of circa 1852,her married name was McCarville. Julia Anna Phelan was born circa 1833 at Ireland also reported as New York. Julia Anna Phelan married James McCarville, son of Hugh McCarville and Bridget Greenan, circa 1852. Julia Anna Phelan died on 8 January 1874. Name Variation Mary Ann McCarville was also known as Julia. Married Name 16 January 1894 As of 16 January 1894,her married name was Kessenick. Married Name 16 January 1894 As of 16 January 1894,her married name was Kessenich. Mary Ann McCarville was born on 8 October 1870 at Wisconsin also reported as Jan 1870. 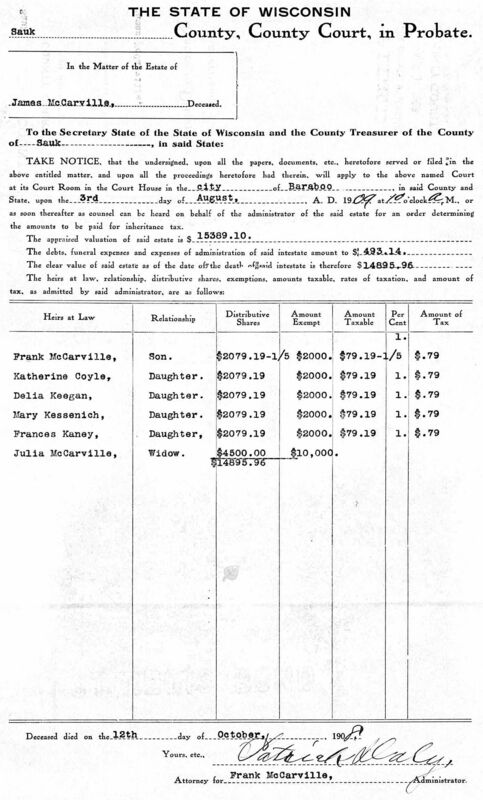 Mary Ann McCarville married Peter Kessenich Jr., son of Peter Kessenich Sr. and Clara Motzer, on 16 January 1894 also reported as 16 Jan 1892. 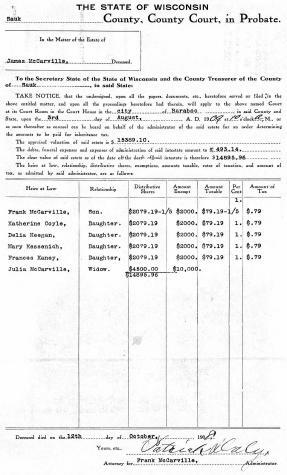 Mary Ann McCarville was listed as a beneficiary in James McCarville's will on 2 March 1909 at Sauk, Wisconsin. Mary Ann McCarville died on 14 December 1954 at Bear Valley, Richland, Wisconsin, at age 84. Mary Ann McCarville had 9 with 8 living in May 1910 children. She lived in 1950 at Bear Valley, Richland, Wisconsin. Children of Mary Ann McCarville and Peter Kessenich Jr.
Name Variation Peter Kessenich Jr. was also known as Kessenick. Peter Kessenich Jr. was born on 29 September 1862 at Wisconsin. He was the son of Peter Kessenich Sr. and Clara Motzer. 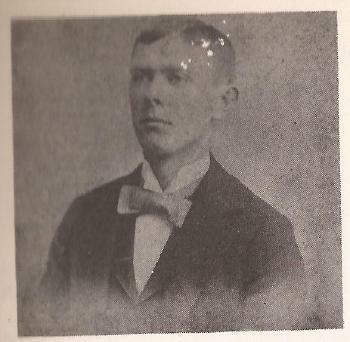 Peter Kessenich Jr. married Mary Ann McCarville, daughter of James McCarville and Julia Anna Phelan, on 16 January 1894 also reported as 16 Jan 1892. [S255] Wisconsin Richland County Death Index, by Wisconsin, 14b-150. 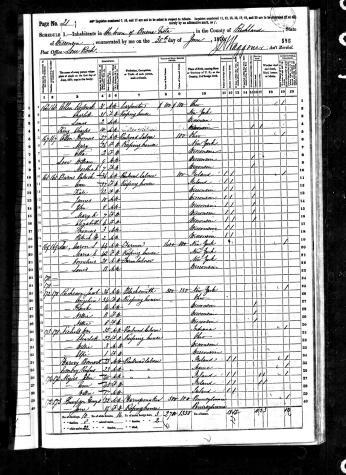 [S246] U.S. Federal Census 1880 U.S. Federal Census, by Ancestry.com, NA Film Number T9-1446 Sheet 50B. Name Variation Patrick Byrne was also known as Burns. Name Variation Patrick Byrne was also known as Pat. Patrick Byrne was born on 18 September 1829 at Ireland. Patrick Byrne married Anna Hullen, daughter of John Hull, before 1858. 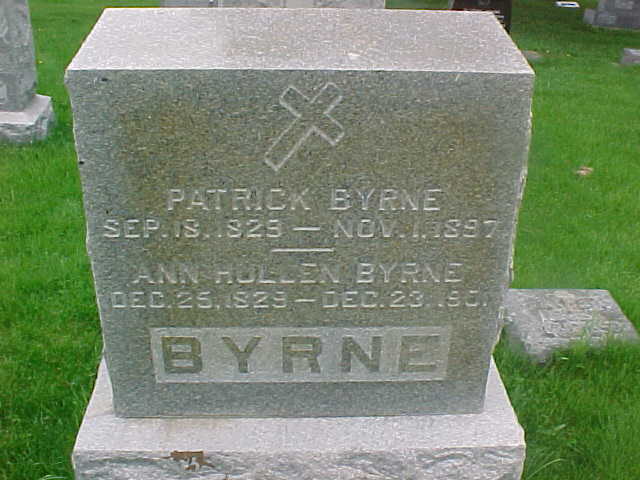 Patrick Byrne died on 1 November 1897 at Richland, Wisconsin, at age 68. Patrick Byrne lived at Lone Rock, Richland, Wisconsin. He was a farm laborer in 1860. He was a railroad laborer in 1870. He was a laborer in 1880. [S180] Wisconsin Sauk Co Cemetery Records Vol 6, pg 13. Name Variation Edward James Phalen was also known as Ed. Name Variation Edward James Phalen was also known as Eddy. Name Variation Edward James Phalen was also known as Phelan. Name Variation Edward James Phalen was also known as Edwin James. Edward James Phalen was born on 16 April 1879 at Wisconsin. He was the son of Patrick Phalen and Catherine (?). Edward James Phalen married Nellie A. (?) circa 1905. 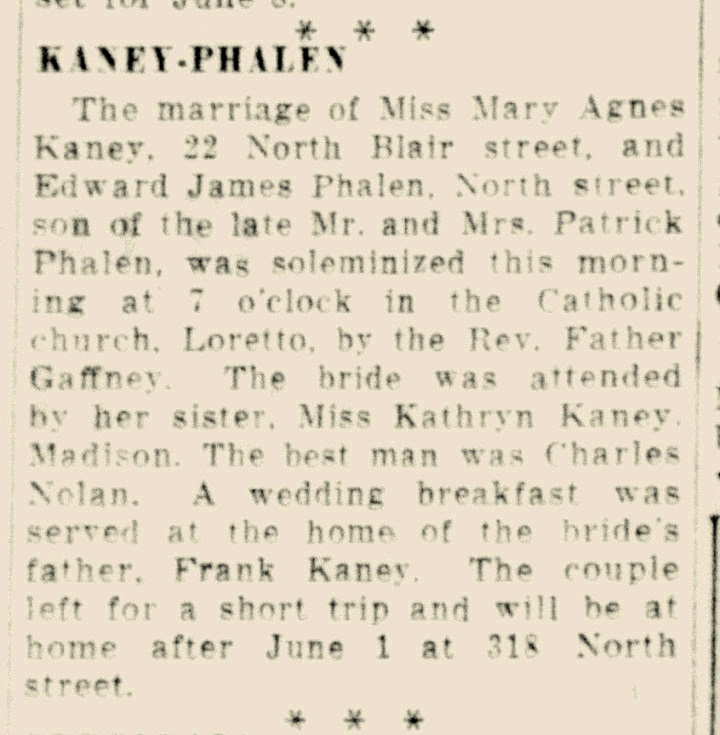 Edward James Phalen married Mary Agnes Kaney, daughter of Frank Kaney and Anna Mary Walsh, on 15 May 1929 at Sauk, Wisconsin, #13-587; marriage license issued 10 May 1929. Edward James Phalen was buried in 1947 at Resurrection Cemetery, Madison, Dane, Wisconsin. 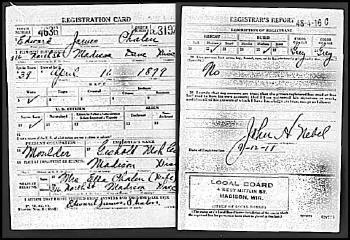 1 June 1905 Madison, Dane, Wisconsin Edward James Phalen appeared on the census of 1 June 1905 at Madison, Dane, Wisconsin. 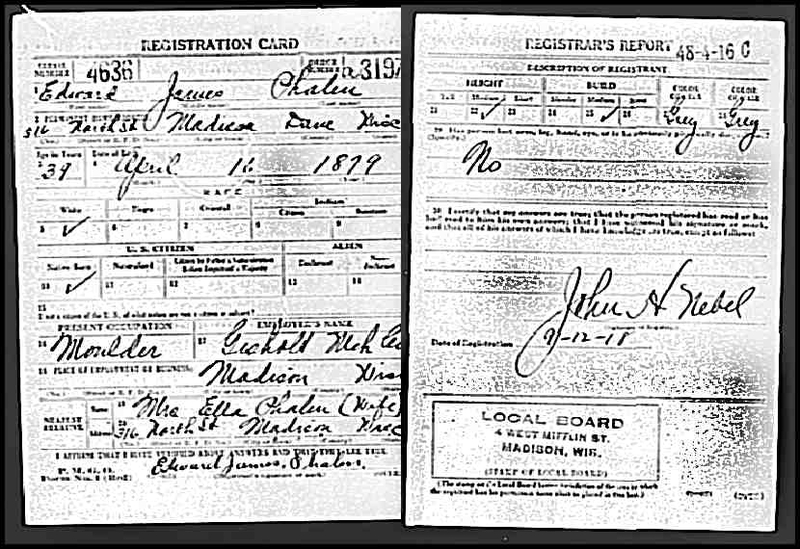 On 12 September 1918 at World War I Draft Registration, Madison, Dane, Wisconsin. [S246] U.S. Federal Census 1880 U.S. Federal Census, by Ancestry.com, NA Film Number T9-1421 Page Number 104A. [S245] U.S. Federal Census 1900 U.S. Federal Census, by Ancestry.com, ED54. Dwelling 359. [S244] U.S. Federal Census 1910 U.S. Federal Census, by Ancestry.com, ED70. Dwelling 98. [S243] U.S. Federal Census 1920 U.S. Federal Census, by Ancestry.com, ED57. Dwelling 22. [S250] U.S. Federal Census 1930 U.S. Federal Census, by Ancestry.com, ED13-45. Dwelling 591. 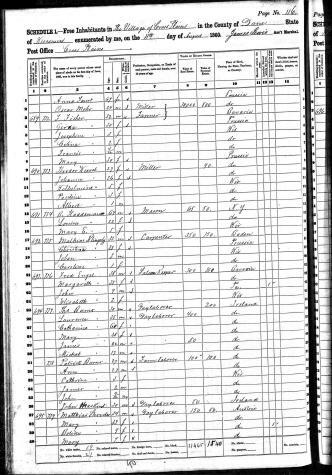 [S373] U.S. Federal Census 1940 U.S. Federal Census, by Ancestry.com, Year: 1940; Census Place: Madison, Dane, Wisconsin; Roll: T627_4470; Page: 12B; Enumeration District: 13-62A. Name Variation Charles Peterson was also known as Charlie. Charles Peterson was born circa 1893 at Sweden. 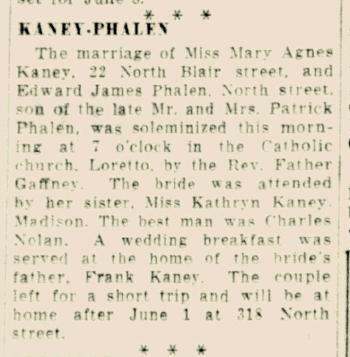 He married Kathryn Kaney, daughter of James Francis Kaney and Mary Anne Byrne, circa 1921. Charles Peterson immigrated in 1898. He was a painter at paint shop in 1930. Martin Mears was born in December 1855 at Wisconsin. Martin Mears died on 3 November 1927 at age 71. [S5] Wisconsin, Wisconsin Marriages, 1835-1900, #1-332. [S246] U.S. Federal Census 1880 U.S. Federal Census, by Ancestry.com, ED246. Dwelling 77. Page 9. Baby boy Mears was born before 1900. He died before 1900 at died in infancy.